One Four All & All Four One! Not long after my wife and I moved to California, she got in touch with Mr Puzzle and ordered some puzzles for me for my upcoming birthday. Yes, I knew back then she was a keeper! One of the puzzles she decided on was One Four All & All Four One! designed by Arcady Dyskin & Pantazis Houlis. Themed around the Four Musketeers, I guess the look appealed to her, and I certainly wasn't disappointed when I opened my presents! 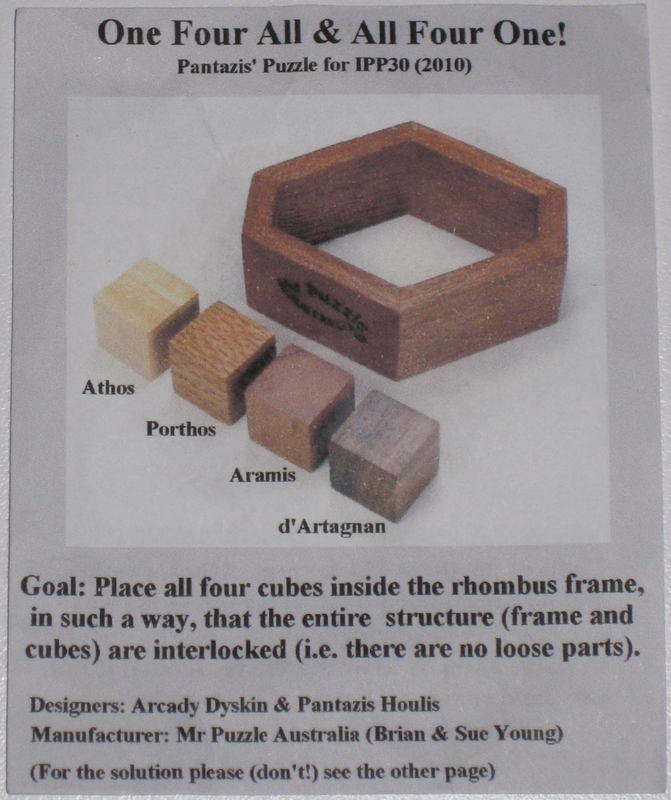 This is a very simple four piece puzzle, with a frame, with the simple goal of "placing all four cubes into the rhombus frame, in such a way, that the entire structure (frame and cubes) are interlocked (i.e. there are no loose parts)." Yes, I used simple twice in that sentence. Do I even need to comment on what that means? Each of the cubes is 3/4" and the frame is 3 1/2" x 3" x 1 1/8". 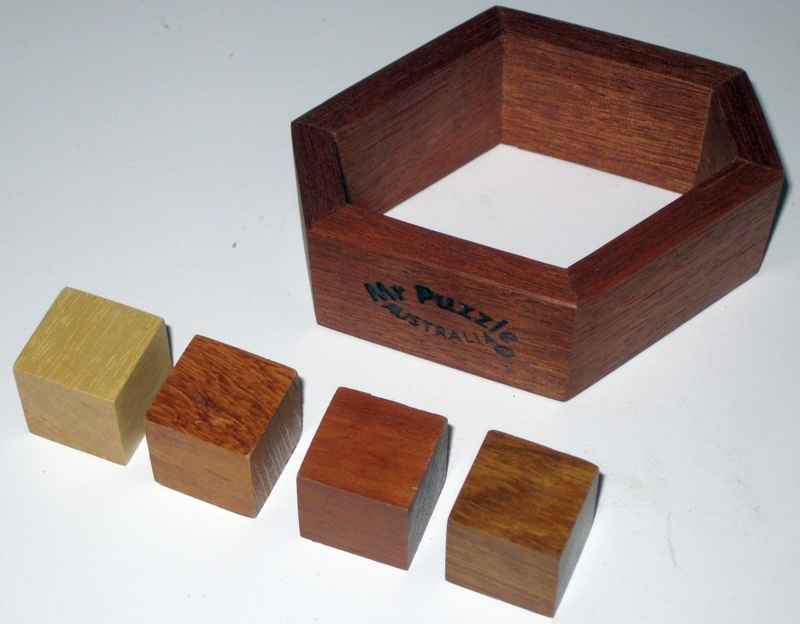 The cubes appear to be Maple, Lacewood, and two others probably native to Australia if I know Mr Puzzle. Sadly I can't find much more information about them, suffice to say they are contrasting woods. This particular copy was used by Pantazis as his exchange puzzle at IPP30. The puzzle was also entered into the design competition at IPP30, and received a top 10 place in the judging. As you can see from the info sheet, each of the cubes has been given the designation of one of the four Musketeers. It doesn't change the puzzle any, but keeps a nice theme flowing. As you've probably guessed, the reason I've not written about this before now is because the puzzle is so simple. It's so simple in fact, that even with the solution printed on the other side of the card, it took me a very long time to solve. 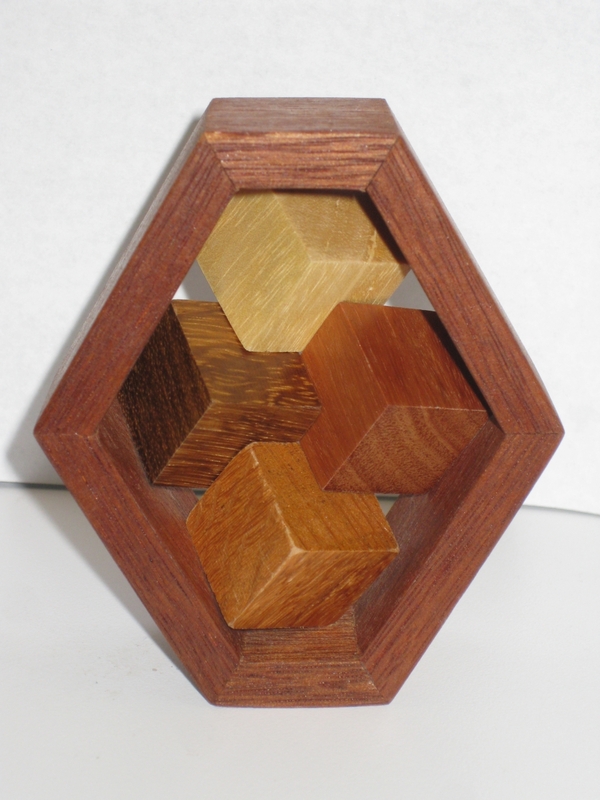 This is not just a logical challenge to understand how to interlock the pieces, but also a dexterity challenge to place all the pieces in the correct orientations within the frame. And trust me, juggling four pieces inside the frame at precise angles is anything but simple. I don't normally talk about puzzle solutions, or show them, but in this case I feel I'm justified. Amusingly, on the solution side of the puzzle card, it states "Beware: Even knowing the solution, it is not easy, and some musketeer skill is needed!" Forget musketeer skill, a bloomin' Ninja would struggle with this one. I have no doubt that when Mr Puzzle made these, he tested the fit of each and every one of them. And I have to commend him for that as this is one infuriating puzzle. If there's an easy way to get the cubes in place I've not found it. Yes, I did solve it, and I took a photo to prove it. If you want to see it, click the link here. It looks great, and it's one heck of a challenge. I doubt it will live on my shelves solved as it's so challenging to put together, but it is a great puzzle, and really deserves some recognition. You may struggle to find a copy, but if you spy one for sale or see it in someone's collection, don't pass it up. It is worth a crack. It really is fiddly. Sadly the larger version was limited to just 30 copies. Good to know that there’s a version out there which is less of a juggling act! Have a bash on my (larger) copy when you’re over, Neil… still fiddly, but definitely doable.